"Your truly unique and excellent series - Ranbaxy"
Available in Print or two CD formats for immediate in-house use. Working examples provided on how to convert development SOPs into your own customised research-based-development system that meet all international regulatory guides, guidelines and regulatory requirements. 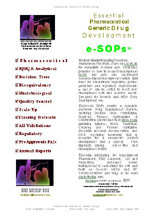 e-SOPs provide Development, Decision Trees, Formulation, Scale-up, Process Optimization & Qualification; pivotal and final large scale validation batches; analytical, cleaning and process validation; essential documentation and generic regulatory know-how that is essential for a successful product development and a speedy FDA approval, saving queue-time and development dollars. Essential information for Development Pharmacists, R&D Chemists, QA and Regulatory personnel. Allows management to understand the nuts and bolts on Generic CTD/ANDA and EC Development and filing in the most cost effective way. Complete Volume in three parts 1790-1850 pp. Parts 1, 2 and 3 fully illustrated with diagrams, flow charts, graphs, side-by-side comparisons, tables in b/w & color. Available in print (spiral soft cover) or via digital CD (multi-users require additinal optional license).